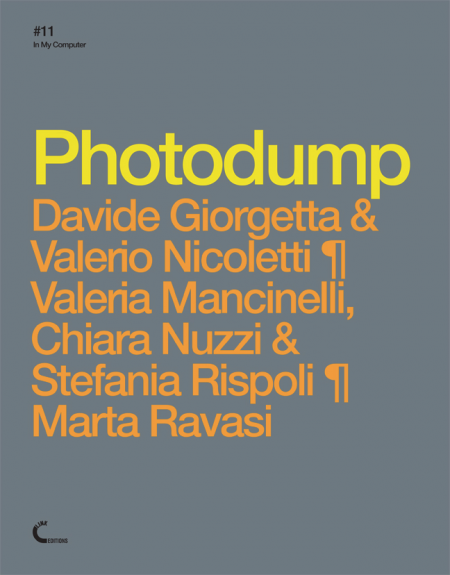 The Link Art Center is proud to announce that Photodump, the 11th issue of its ongoing book series “In My Computer”, is now on Link Editions shelves. The book, designed by Kaspar Hauser, is available in print on demand as a 200+ color paperback, and as a free download pdf on Lulu.com. Photodump features three distinct contribution, all based on image collection, and made by young Italian authors who work within a very specific field but like to cross borders. Suddenly in the Digital, by Davide Giorgetta and Valerio Nicoletti, is a systematic research on interface incidents and their ability to break the digital medium supposed transparency and immediacy, by bringing the medium itself to the fore. A Collection of Trophy Images, by Valeria Mancinelli, Chiara Nuzzi and Stefania Rispoli, is an a-systematic research into contemporary trophy images, conducted with a curatorial attitude by involving other people in the game. Paradise Parade, by Marta Ravasi, is an idiosyncratic research into amateur image production and pop culture, silently and intimately compared to the tradition of painting. The reasons for a given choice are always transparent in the first project, detectable in the second, mostly mysterious and personal in the third. The Link Art Center is proudly part of Masters & Servers. Networked Culture in the Post-Digital Age, a European adventure focused on a new generation of digital interventionism, awarded with a Creative Europe 2014 – 2020 grant. Up to August 2016, Masters & Servers will explore networked culture in the post-digital age.